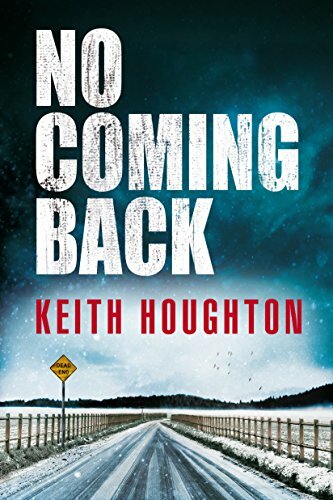 In the wake of Vidar Sundstøl’s “Minnesota Trilogy” books, which did not send me over the moon, I tried a different mystery novel, also set in Minnesota’s Arrowhead region – No Coming Back, by Keith Houghton. Alas, I did not love this one either. While Sundstøl’s books are stylish but (in my opinion) perverse, Houghton’s book seemed to me over-beaten and under-baked. Though not without promise. Jake Olson returns to his (fictional) home town of Harper, Minnesota after nearly 20 years gone. He’s been in prison, convicted as a teenager of killing his girlfriend, Jenna. He didn’t do it. Now (and this is one of the first of many improbabilities that abound in this story) the local newspaper publisher, who has always supported him, hires him to re-investigate the murder and identify the real killer. On the same day Jake comes home (another improbability), a large tree, a local landmark, is toppled by a storm. Under the roots a skeleton is found. Jake is convinced it’s Jenna’s. Now he’s on a mission, but he has lots of opposition. Jenna’s brother has promised to kill Jake. The local sheriff has always hated him, and is just waiting for an excuse to bust him and send him back to Stillwater on a parole violation. And there are larger challenges. Everybody in this book – everybody – is lying. Everybody has something to hide. The whole thing was too much for me. Too many conspiracies, and too complicated. Too many lies. Too much violence for the setting. Too many villains. Toward the end I didn’t even care about Jake, which is a major narrative failure. I think Keith Houghton shows promise as a novelist. He can turn a good phrase when he’s on his game (though his diction can be sloppy too). But this book was just too convoluted and nihilistic for its own good, in my view. Cautions for language, violence, and adult situations.